The Daily Stats Widget is a one-stop Google data shop. With the widget, you can compare any of the metrics available within the Google Analytics API to that of Google Search Console, and even to Google Ads. This is an obvious advantage since Google does not allow you to necessarily make comparisons between the data within its various platforms (i.e., Google Analytics, Search Console, and Google Ads). The widget enables you to compare a custom set of metrics across the data sources. In fact, you can custom select the most important metrics to you from all three platforms. For example, you are able to display metrics such as new users, bounce rate, goal value and ad clicks, ad cost... etc. This widget not only has the ability to offer huge amounts of data, but via its date settings can help gather information to better understand and compare your performance to other reporting periods. To this extent, you can choose to add columns that show your current performance relative to the previous reporting period. The Marketing Funnel Widget is a customizable widget that gives you the opportunity to share your site's path to success. Making use of your Google Analytics integration into Rank Ranger, the Marketing Funnel allows you to present how users engage with your site. The widget gives you the ability to custom select which Analytics metrics you want to display and in what order. The result is the ability to showcase user behavior and interaction as it impacts your conversions and goals. To help you tell the story of your site's traffic, the Marketing Funnel can be set to show the data range you desire. 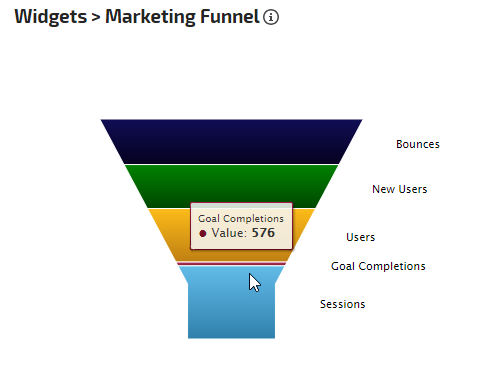 Further, the size and color scheme of the widget can be altered to your liking, as well as the width of the funnel. The result of this is the power to showcase the flow and overall impact of your site's traffic in a way that fits your specific needs. Last up are two widgets, both of which help you gather insights into who your users are. Each widget takes a look at a unique segment of data that when analyzed together offers a comprehensive look at your users. The Google Geo Location Widget enables you to view your Analytics performance across all markets. Here you are presented with a map that through its color shading indicates performance within a specific market. To get a numeric representation of your site's performance in a given country simply hover over the location map. When looking to present your site's audience by age and gender the Google Analytics Audience Demographics widget presents a broad set of insights at a glance. Specifically, the widget shows the age and gender demographics of your users during the previous month. Supporting the Google Geo Location, the data here allows you to see who your audience is, not only what market they reside in. As we've alluded to, the most prolific use of these widgets comes when shared within our white label reports, specifically the Marketing Dashboard, which offers full access to the HTML and CSS (so that you can make your dashboards look and feel like any website you want). Simply put, this is a great way to showcase your site's performance to your clients as the dashboard gives you the option to embed videos, surveys, and anything you deem necessary to highlight your site's growth and success. More, the Marketing Dashboard offers you the opportunity to insert explanatory notes to your clients, which makes it the perfect place for the easy to discern widgets we've created. Utilizing these new SEO widgets brings with it the ability to present your SEO success in a way your clients can effortlessly understand. The last thing you want to do is present data that simply confuses your reader, who may not be extensively familiar with SEO. Widgets by their nature, offer up insightful yet complex data in a highly visual way, making it digestible to any user. Which is why these new widgets are a great addition to your white label reports!